I hope that my regular readers won’t mind that this post presents a cultural critique rather than the sorts of subjects on which I typically write. 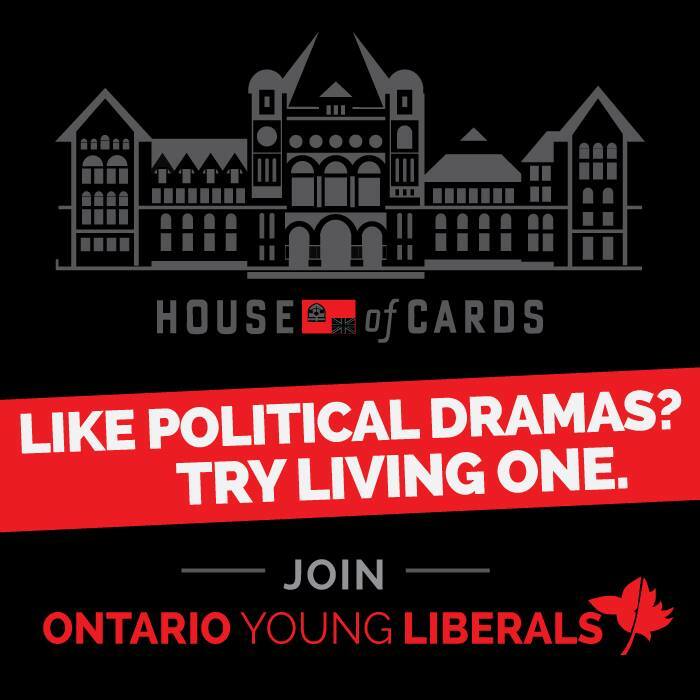 Those of you who have watched House of Cards (either the British version or the new American iteration on which this poster is based) will recognize this promotional poster that the Ontario Young Liberals recently published. At first, I thought that it was satire and that the Ontario Progressive Conservative Youth Association, the Young Liberals’ rival group, had created it in order to critique the Liberal Party of Ontario as corrupt and power-hungry. The Young Liberals probably thought something to the effect that this poster makes politics seem exciting and that it would help recruit passionate politicos to their team. 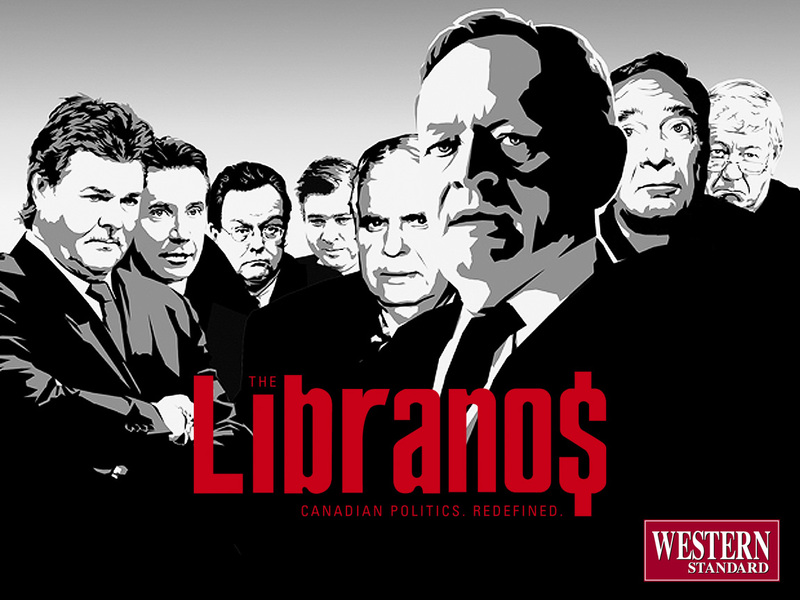 In reality, the Young Liberals have made the Conservative and New Democratic case against their own party – that the Liberals run a corrupt, entitled, wasteful government – just as effectively as the Western Standard did in 2004 through this poster, which parodies the HBO series The Sopranos and lampoons the Liberal Party of Canada for having perpetrated the Sponsorship Scandal. The Ontario Young Liberals seem oblivious to irony and satire, because this promotional poster in fact reflects poorly on the Liberal Party of Ontario and on the McGuinty and Wynne Governments. An astute politico who has watched House of Cards might very well think – though I couldn’t possibly comment – that the Young Liberals are suggesting that Kathleen Wynne represents Frank Underwood, and that she orchestrated the Gas Plant Scandal as a pretext for McGuinty’s resignation in 2013 so that she could become leader of the Liberal Party and Premier of Ontario. The Young Liberals also might not have realized that an upside down flag is a sign of distress, and not merely a logo for the American version of House of Cards. Ironically, the Young Liberals have thereby acknowledged that the McGuinty and Wynne Governments have put this province in distress. In short, this promotional poster is unintentionally revealing in its damning criticism of the McGuinty and Wynne Governments, and it exemplifies the disturbing convergence of satire and genuineness in politics. The Young Liberals have thus proven Poe’s Law: without the modulated voice inflections and gestures that we experience in personal interaction, it is often impossible in print media to distinguish between a genuine argument or slogan and its parody. This entry was posted in Humour & Satire, Political Parties. Bookmark the permalink.